The latest trend is butterflies and it’s not just about the odd picture here and there, it is embracing the winged beauty and there is no better place than in the bedroom. The gorgeous colours and the designs on fabrics and wallpaper are hitting the stores and there is something for everybody, providing you like butterflies. If you are unsure of how to use this trend in the bedroom, you’ll soon find inspiration all around now spring is upon us. A feature wall in the bedroom with butterfly motifs is an easy way to incorporate the trend, or you could simply update bedroom wardrobes with a few easy peel butterfly stickers, not the children’s stickers though. 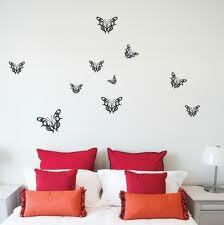 Grown-up stickers are bold, bright and classy; these would look great on white bedroom furniture. Your tastes maybe less is more, you’ll find cushions adorned with majestic butterflies, ideal to sit upon the bed and they add a touch of glamour with up to the minute interior design. There are rugs with a simple motif or rugs with a flurry of colour to bring your bedroom into the season. However there is one bedroom you can go overboard on, a little girl’s bedroom. You can use stencils and ask your child to help decorate their room, using colours of their choice to paint the butterflies. The stencils could be used on the walls or wardrobes or you could buy some fabric paint and plain bed linen and give a totally individual look to your child’s room. The possibilities are endless, even wall art can add an impact to a room and give the appearance of a total revamp. Simply using an old picture frame or buying one for the purpose, you can cut out images of butterflies from magazines and create a collage or ask your child to paint a piece of art to go in the frame. Make sure they sign it; it may be valuable one day. The butterfly trend is fun and creates the image of spring and summer all rolled into one, what better way to wake up in the morning when your bedroom and bedroom furniture make you smile.